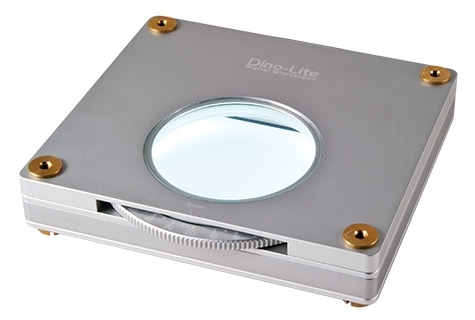 The BL-ZW1 is a back light illumination table with adjustable polarization for the Dino-Lite. Please note that the polarizing feature has to be used with the Dino-Lite digital microscope with polarizing abilities; such as the AM4113ZT or the AD4113ZT handheld digital microscope. An optional accessory that can be attached to the BL-ZW1 is the BL-GC1 Gem Clip (The BL-GC1 Gem Clip is sold separately). The polarizing ability of the BL-ZW1 can be used for many applications such as but not limited to geology (examining thin rock sections), metallurgy, and chemistry. For a business owner point of view, it can be used for jewelers for inspecting and presenting jewelry/ gems. The BL-ZW1 polarizing ability can also be useful for industrial applications; such as inspecting flexible circuit boards (FPC) for flaws and defects.